Xandr was both our team and Linda's first (of many) JRT and was a great ambassador for her breed- Sweet, obedient, highly trainable, but competitive and driven. At 13 months she started racing and threw her heart and body into competition. Xandr's racing longevity, from 1998 until 2009, earned her 111,699 points, competing in 148 events and averaging 755 points each tournament. 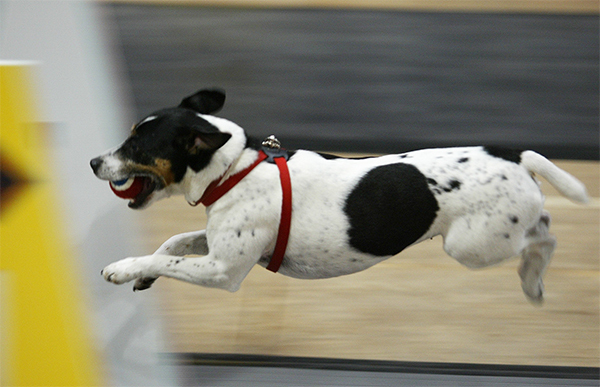 She was the first JRT to earn her Hobbes and was extremely reliable, consistent and dependable throughout her career. She earned most of her points as the primary height dog on the team, jumping 9 inches (old rule) and consistently stayed under 5 seconds most of her career, racing in any position. She frequently double ran on our mixed breed and regular teams, earning over 30,000 mixed breed points. Xandr enjoyed traveling to participate, competing in all of region 1 and 2 regularly, but also going as far as Arizona, Alaska and Nova Scotia (and many other states). Although she retired at 12.5 yrs old due to a medical condition (Myasthenia Gravis), she continues to thrive and be a great cheerleader to the team, wanting to race even at 16.5 yrs old- just without the jumps and ball!